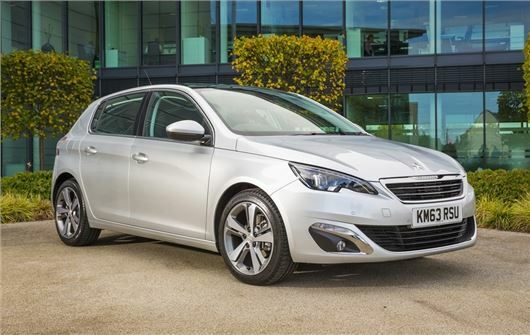 UK Car Discount is offering savings up to £6000 on brand new Peugeot 308s. All 64-plate vehicles are new and first registered Keeper. They are also UK dealer supplied with full manufacturer's warranty with free delivery in mainland UK. New Peugeot 308 Access models feature LED daytime running lights, colour coded door mirrors and handles, manual air conditioning, electric one touch front windows, cruise control with speed limiter, DAB digital radio with USB support. New Peugeot 308 Active models feature 16-inch alloy wheels, dual zone air con, electric handbrake, rear parking sensors, leather steering wheel and gear knob, automatic headlamps and wipers, 9.7 inch multifunction colour touch-screen with sat nav and river lumbar support. New Peugeot 308 Allure models add the following to the Active trim: 17-inch alloy wheels, LED headlamps with fully integrated LED daytime running lights, reversing camera & front parking sensors and electric folding door mirrors. New Peugeot 308 Feline models add the following to the Allure trim: 18-inch alloy wheels, panoramic glass roof, tinted rear side windows, half alcantara trim sports seats with lumber support, keyless entry, driver assistance pack (dynamic cruise control, emergency collision alert and emergency collision braking system).